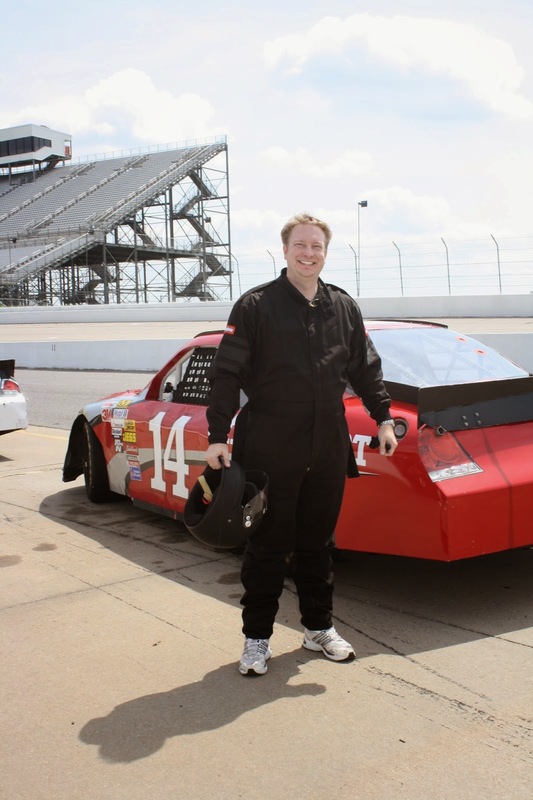 Months and months ago I bought Chris the Rusty Wallace Driving Experience package on Groupon. It was a good deal, and who wouldn't want to drive a race car as fast as they can. Anyway, he was finally able to do it this past weekend and he said he loved it! He had such a great time. He said he was a little nervous when he first got there but was fine by the time he got into the classroom. If I did it on the other hand I would just be too nervous. I could do the ride along part, but there's no way I'd be able to drive the car on my own. Waiting on Chris to get suited up. Ah, the beautiful classic black and white. Yeah, I didn't check my white balance and so the first half of the pictures are all blown out. I salvaged that one by switching to black and white but it's still too overexposed. Luckily I realized it while Chris was on his ride along so I was able to get the rest of the pictures ok.
After the ride along, talking to the crew. Notice the "tail lights". Can you believe they actually put light stickers on the cars! I thought that was just a joke in Cars. I know race cars don't need lights but I just figured it would be a flat surface. The stickers made me giggle. So when he first got there he had to go to a 45 minute class. 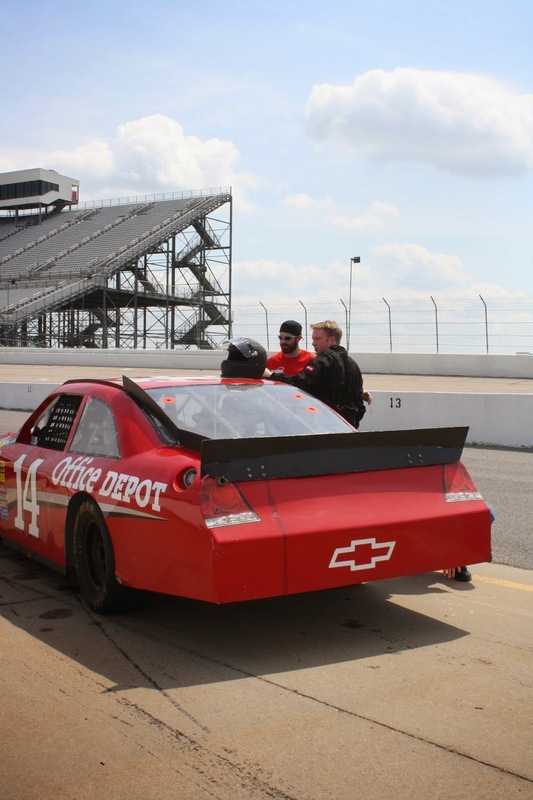 Then he got suited up and did a 3 lap ride along with a professional driver first. After he hopped out of the ride along they took him straight down pit row and put him in a car to drive. After he got loaded in, I took the kids over to the bridge so they could see it better. They were very excited. Cody kept saying how "daddy driving Lightening McQueen". I missed it because I was taking pictures. But one lap some guy passed Chris. The next lap the guy spun out and was in the grass. I heard some other people hollering "whoa!" And I asked what I missed and they told me that someone just spun out. I asked what car and it wasn't Chris so that was good. They said he just missed it and "he probably needs some new pants". After it was all over I asked Chris about it, apparently it was no where near him but he did see the guy in the grass after it happened and then the radio told him to caution for 2 laps while they got it cleared up. But they also gave him a few extra laps since he had to drive at caution for a bit and after they got it cleared up he had the track to himself for a couple of laps and was really able to go fast. He had a great time. And the kids enjoyed watching it. And best of all he didn't wreck because he declined the insurance and had to write on the form "I understand I am responsible for any damages up to $15,000 due on site." So, we would have had to sell a kidney and probably his liver if he had wrecked the car. Good times....good, good times. LOL.. you're so funny. What an awesome experience!